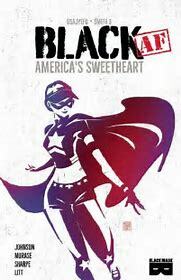 The Fellowship was fortunate enough to obtain a copy of BLACK[AF]: AMERICA’S SWEETHEART from Black Mask Studios. Kwanza Osajyefo writes, Jennifer Johnson draws and colors, Dave Sharpe letters, and Tim Smith 3 designs. Eli Franklin is a pretty normal kid, considering her situation. Her adopted family loves her very much, but she’s not exactly like the other kids. By the time she’s fifteen, her powers are formidable. But she’s a good kid, so she takes the name Good Girl and starts helping people. When she gets the attention of another super bent on destruction, Eli begins to learn who she really is and what it means to a world in chaos. There’s a lot to explore in the BLACK universe, both in the stories and in the sociopolitical landscape. This story gives us a look at how perspective can mean all the difference, and it does so through the eyes of a young person who genuinely wants to do what’s right. Ant the art helps to weave that story with lines and colors that make supers feel quite real. This is an 80-ish page graphic novel in a fascinating world that has a great deal to teach us about our own world. I can’t wait to see more from these creators, and to learn more from their perspective. BLACK[AF]: AMERICA’S SWEETHEART is available now from your local comic shop, or online at blackmaskstudios.com.